In this solar eclipse, the annular solar eclipse can be seen inside the area called “Central Phase”, the south of Kyushu, most of Shikoku, from Kii Peninsula to Kanto area. 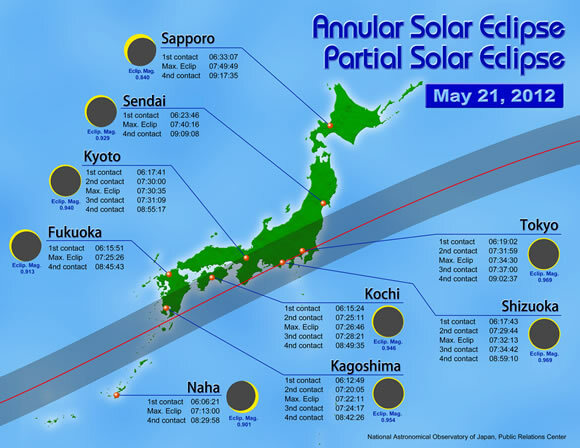 Additionally, the partial solar eclipse can be seen in other area of Japan. Inside the Central Phase, it is possible to observe the shape of the Sun looks like donut at just before and after the max eclipse. The Moon will cross the middle of the Sun when the view point would be closed to the center of the Central Phase, and the Moon will pass through away from the middle of the Sun when the view point would be near to the edge of the Central Phase. Around Tokyo, Shizuoka, Kyoto, Kochi, Kagoshima and so on are inside the Central Phase. In addition, the partial solar eclipse would be observed outside of the Central Phase. The eclipse would be larger if the view point is closed to the Central Phase. The depth of eclipse is shown in the number, that is “Eclipse Magnitude”. Eclipse Magnitude 0.1 means that the Moon covers 10% of the Sun's diameter. In the outside of the Central Phase, the max eclipse magnitude is 0.929 at Sendai, 0.901 at Naha, and 0.840 at Sapporo where a little far from the Central Phase. Look at the chart below, that shows the time of start (1st contact), max, and end (4th contact) of solar eclipse at some main observation points. Please use the following information if you want to know more detail at other cities. The above image shows the area of the Annular Solar Eclipse and the Partial Solar Eclipse is seen. This coming annular solar eclipse will be observed inside the area named “Central Phase” in the image. Also, the partial solar eclipse can be seen in the large area where is surrounded with the line of outside the Central Phase. Visibility of the Solar Eclipse in Japan is already explained, but also including the other countries, the Central Phase would start at the southeast coast of China, graze the north edge of Taiwan, and pass through from Japan to west side of America with crossing the north of pacific ocean, then it would end at south central of America. For more detail about the central phase, it can be found out with the Local Prediction of the Solar Eclipse (Ephemeris Computation Office) when you choose “May 21, 2012, Annular Solar Eclipse” and go “Central Phase”. Please use this system.